Aug. 9-11 — The Fifth Annual Los Angeles Tanabata Festival, “Spirit of Kizuna” takes place in Little Tokyo, First St. and Central Ave. Opening ceremony takes place on Friday, Aug. 9 at 5 p.m., Saturday, Aug. 10 from 11 a.m. to 7 p.m.; Sunday, Aug. 11 from 11 a.m. to 5 p.m. Enjoy entertainment, food, games and kazari contest. This year features debut of the Manga/Anime category. Presented by the Nisei Week Foundation, Nanka Kenjinkai Kyogikai and Little Tokyo Public Safety Association.For more information, please log onto www.jhills.com or call the Koban (213) 613-1911. 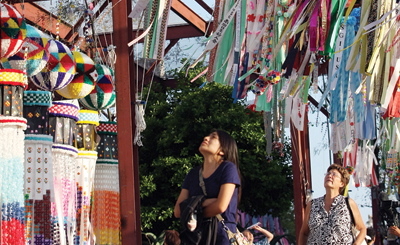 Brightly colored Tanabata ornaments at the annual Tanabata Festival.